A common question asked by traders is whether it’s better to pay the monthly fee at BluFX or to put those funds into a personal account. To answer this question, we will look at the mathematics as well as the intangible pros and cons of both options. We must first consider the concept and reality of financial leverage. We have a total of 200 to invest and we have a choice of paying the BluFX fee or funding our own trading account. We want to turn 200 of our own capital into 500 or 1000 in a month. This is only possible with financial leverage. This leverage is a short-term loan given to a trader, proportional to his deposit. The purpose of this loan is to multiply gains, however losses also multiply using it. It is a booster that allows a trader to earn MORE or to earn FASTER or lose in the same boosted manner. For beginners, high leverage often leads to wiping out trading capital. The problem lies in psychology, it is natural that a human prefers to increase odds of happening of something desirable and decrease probability of happening of something unwelcome, even if both events have equal odds. In trading, it results in overrating EXPECTED returns and underrating REAL risks. So, to get a better understanding of the leverage let’s compare how trading goes with and without it. We will then look at how the BluFX offer approaches leverage. BluFX offer maximum 3:1 leverage, however we will base our assumptions on an average 2:1 utilisation. You are ready with your 200 account and heard from your uncle that the central bank is going to decrease interest rates from 1.00% to 0.50%. Basically, it means that the bank wants to make borrowings cheaper (cheaper to pay 0.5% interest than 1%). We would expect USD to drop against other currencies. You simply exchange your 200 to Euro by the current exchange rate of 1.1300 and get 177 EUR. Next day, the rate is cut to 0.5%, USD depreciates against other currencies and EUR/USD exchange rate surges to 1.1500. You exchange your 177 EUR back to US Dollars and get 177*1.15=203.55. Good profitable trade – you made a grand total of 3.55. If the trade had gone the other way you would have lost 3.55 or 1.725% of your account. It’s going to be a long time before you can make your 500 or 1000 at this rate! Now the broker applies leverage to our account. We had 200 and by applying all 1:500 leverage we now have 200*500=100 000. Remember that the new amount is a loan while we have our broker account. Let’s enter the previous trade in the example above (buy EUR for Dollars) but now use our loan (leverage). Exchanging 100 000$ to EUR we receive 100 000/1.13 = 88.495 EUR. When we exchange back after the EUR/USD rate rises to 1.15 we receive 88.495*1.15=101769 Dollars. We thank the broker and return the loan and our profit is 1769-200=1569. That’s great with winning trades, how about losing trades?. Let’s say your uncle was wrong and the central bank decided to leave the interest rate unchanged at 1.00% and USD appreciated against other currencies. EUR/USD exchange rate dropped to 1.1000 on the news. With 1:1 leverage if we exit then we get back 177*1.10=194.7 resulting in 5.3 loss. But what happens with a leveraged trade? As you exchanged $100 000 to 88 495 EUR at 1.1300 and EURUSD dropped to 1.1000 you get back 88 495*1.10 = $97 345. But you have only 200 in your account, the loss is much bigger? Does the broker pay it for you? The answer is NO. The broker won’t simply allow you to hold position open till the rate drops to 1.1000 and close your position even earlier. Earlier, but where? To calculate that you need to understand the brokers risk model and the pip value which is how much profit or loss you incur when EURUSD moves by 1 pip. 1 pip is 0.0001 of the foreign exchange rate or 1/10000th of the trade size. In our case, 1 pip move causes a change from 1.1300 to 1.1301 (pip up) or 1.1299 (pip down). In case of 1:1 leverage and $200 position, 1 pip value (in $) is (0.0001*200)/1.13=0.018 or 1.8 euro cents. That’s why when exchange rate dropped from 1.1300 to 1.1000 (300 pips) you could lose 0.018*300 pips~ $5.3. But when you trade full standard lot ($100 000) pip value is (0.0001*100 000)/1.13= 8.85 EUR. So basically, it means that your 200 will be wiped out for 22.59 pips. It means that your account will be zero at only 1.1278 rate. As you can see when using leverage the speed of earning and losing increases significantly. Is it safe for brokers to provide such big loans (leverage) to traders? From the brokers perspective, it is almost 100% safe for a broker to offer leverage to traders. As the currency market has very high liquidity, when our position reaches critical drawdown, brokers automatically stop the trade, deduct the loan and leave us with losses. To protect themselves from risks connected with leverage, a position is closed when drawdown reaches 30% of required margin. In our example above, in case of drawdown our position will be automatically closed when drawdown reaches 70% from 200 or 140. There’ll be only 60 left in our account and we will be asked to provide some more before trading the previous amounts. 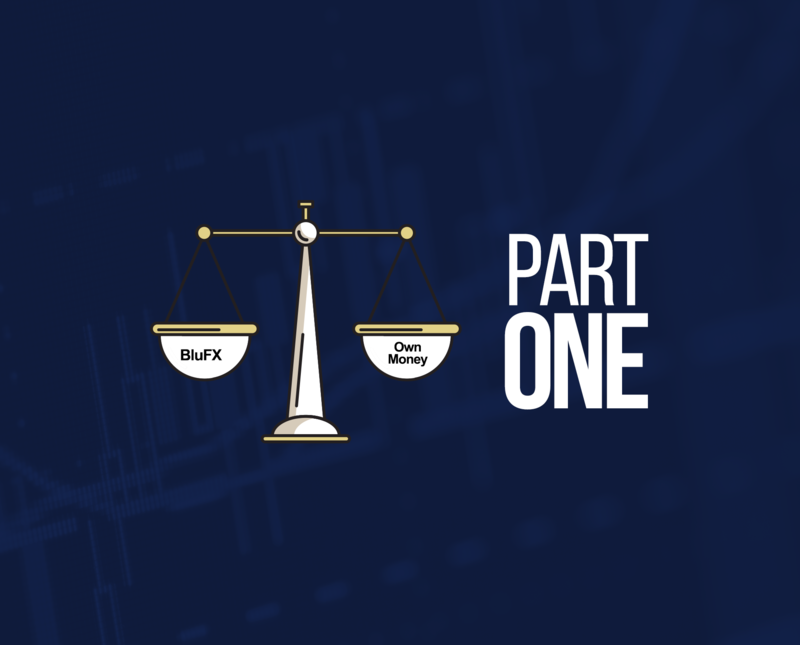 At BluFX instead of receiving 500:1 leverage on your 200, your account is funded by 50,000 with a maximum 3:1 leverage meaning that you can trade the same $100,000 size as a 200 account with 500:1 leverage using 2:1 BluFX leverage or $150,000 with the maximum 3:1 BluFX leverage. However, the significant difference is that you are not stopped out after a loss of 140 which you would be with the broker. Instead you are allowed to continue trading. BluFX review your account when your losses pass 10% which is 5000. Your 200 at the broker does not allow any margin for error if you end up in a losing trade, however at BluFX the same 200 allows you to continue trading and building up losses that your broker would not allow. If you are only ever in winning trades then instead of keeping 100% with your broker, with BluFX you would keep 50% - minus your original 200 which is a fixed cost. In Part 2 we will look at how the choice of deploying 200 applies specifically to 4 typical trading career trajectories.